I have been wanting a copy of The Midsummer Garden ever since I saw the cover a few months back. Yes... I judge books by their covers, or rather, I lust after them and want desperately to have them in my collection. Never underestimate the value of a great jacket design, folks! When I read the blurb for this gorgeous looking book, I was sold. Multi-narrative historical fiction, a found object tying the past to the present-- yes please. It sounded like exactly my cup of tea. The kind of book I could get absolutely lost in. And boy, did this book live up to expectations! Pip Arnet is given a big set of cast iron pots for an engagement gift. Inside, she finds papers with French recipes written on them, and is intrigued. Who wrote them, and how long ago? The answer, revealed to the reader, takes us back to Medieval France, where Artemesia is cooking a lavish feast for the wedding of Lord Bouchard to Lady Rose, and thinking of her own betrothed, Andreas. As Pip and her partner Jack navigate the bumpy road that comes after their engagement, their love story is bolstered by the story of Artemesia and Andreas, who in a sense, watch over our modern lovers and influence their love story in more ways than Pip and Jack could possibly be aware of. 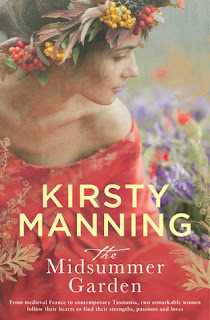 First of all, Kirsty Manning can write. This is a book that is first and foremost about romantic relationships. Love, marriage, and all the stages that come in between. But at no point is the writing sodden with soppy adjectives. Manning writes deftly about the emotions associated with loving someone in a mature, engaging way. While anguish, confusion and heartache all have their roles to play, the book never thumps you over the head with repetitious, overly emotional descriptions, which seems to be the way with quite a few books these days. I think it can mostly be put down to the fact that the character of Pip is so well-developed. Yes, she's following the story line that belongs with her relationship, but she's also got a lot else going on too-- just like a real woman would. She's trying to finish her PhD in Marine Biology, she's trying to figure out what she wants to do with her life, she's worried about her sister... and of course she's fascinated by these beautiful old recipes that were found inside a set of pots given to her on her engagement. Put simply, I really loved this book and I think that if you enjoyed books like Le Chateau by Sarah Ridout, Labyrinth by Kate Mosse or The Shifting Fog by Kate Morton, you'll really love it too.